Any Bf Researcher worth their night vision goggles knows Bigfoot loves to throw stones. MonsterQuest Sasquatch Attack I and Sasquatch II programs show the involvement of stone-throwing Bigfoot as major components of those documentary treatments. The best evidence for understanding BF behavior is through the study of the five great apes that we do have access to; Gorillas, Orangutans, Chimps, Bonobos and Humans. Many of our old BF assumptions are based on our old primate assumptions. As the primate assumptions get upset we need to also reevaluate our BF assumptions. Who is our primate paradigm provocateur? Satino the Chimp. Satino, a canny chimpanzee who calmly collected a stash of rocks and then hurled them at zoo visitors in fits of rage has confirmed that apes can plan ahead just like humans, a Swedish study said Monday. Santino's behavior fascinated researchers because it was so carefully prepared. According to a report in the journal Current Biology, the 31-year-old alpha male started building his weapons cache in the morning before the zoo opened, collecting rocks and knocking out disks from concrete boulders inside his enclosure. He waited until around midday before he unleashed a "hailstorm" of rocks against visitors, the study said. STOCKHOLM (AP) — A canny chimpanzee who calmly collected a stash of rocks and then hurled them at zoo visitors in fits of rage has confirmed that apes can plan ahead just like humans, a Swedish study said Monday. According to a report in the journal Current Biology, the 31-year-old alpha male started building his weapons cache in the morning before the zoo opened, collecting rocks and knocking out disks from concrete boulders inside his enclosure. He waited until around midday before he unleashed a "hailstorm" of rocks against visitors, the study said. 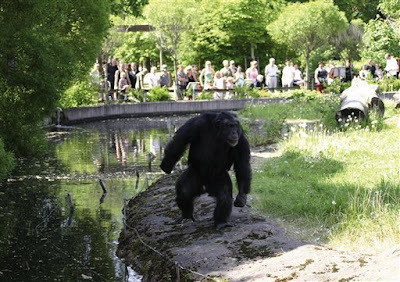 Osvath's findings were based on his own observations of Santino and interviews with three senior caretakers who had followed the chimpanzee's behavior for 10 years at the zoo in Furuvik, about 93 miles (150 kilometers) north of Stockholm. Seemingly at ease with his position as leader of the group, Santino didn't attack the other chimpanzees, Osvath told The Associated Press. The attacks were only directed at humans viewing the apes across the moat surrounding the island compound where they were held.